Furniture designer Johnny Egg has worked across the world, creating bespoke furniture for everyone from private clients to cruise ships. Now working from his studio in rural Essex, Johnny has received industry accolades for his creations, including a nomination by RIBA. His belief is that furniture should be functional, well designed and practical. When a long-term client built a new home in North London, she tasked Jonny with creating a bespoke centrepiece cabinet for the huge six metre squared living room. And after seeing Dimplex’s Opti-V flame effect at 100% Design, he knew he had found just the solution. Dimplex Opti-V uses the latest High Definition TV technology to create flames and sparks for a virtual fireplace experience like no other. The unique and patent protected design combines ultra-realistic flickering flames with three dimensional LED logs that ‘spark’ like they are genuinely alight. Together with an audio element of crackling logs, it creates the ultimate illusion of a real fire. Crucially for furniture design, Opti-V gives off no heat. Instead, the warming glow of the ‘flames’ and ‘burning embers’ create all the atmosphere of a focal point fireplace, without unwelcome heat in warmer months and without the installation challenges that would normally be associated with other fuel types. Johnny said: “I’ve tried a number of fires over the years within furniture installations but it wasn’t until I saw the Dimplex Opti-V effect that I thought ‘this is the one’. Johnny built the Dimplex Opti-V PGF-20 fire, measuring 1356mm wide, into a large cabinet made from wood with veneer which was imported from Germany. It sits below an audio unit and flat screen TV, complementing a series of storage and shelving compartments with bespoke lighting for maximum effect. The project took around three months to complete, including design, build and assembly. The cabinet was built in Johnny Egg’s workshop before it was dismantled, transported to the client’s home and reassembled in position. Dimplex’s Opti-V effect is available in a choice of models without heat including two landscape options (PGF-10 and PGF-20) for wall-mounting or for building into bespoke furniture installations – suitable for domestic or commercial applications. The Dimplex Sunningdale model provides all the benefit of electric in a stove design, providing a premium but portable fire that is suitable for interior design projects with even the highest specification, while the unique Dimplex Cellini and Volterra freestanding models offer a striking design with a lattice frame for a dramatic statement. 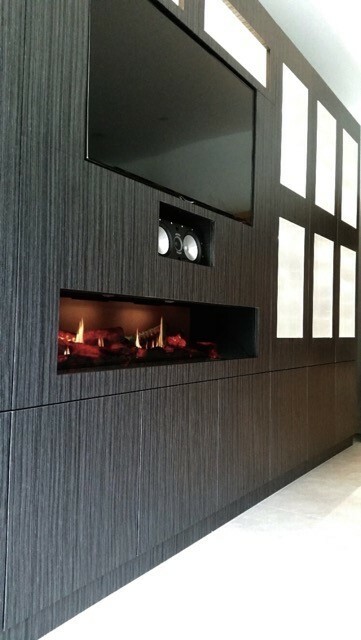 And would the award-winning furniture designer Johnny Egg recommend Dimplex Opti-V to other clients? “I knew when I first saw the Opti-V unit that it has potential. I showed the client for this project and she loved it, especially the realism of the ‘flame’ effect”, he said. Download this case study for more information.